I then ask audiences a rhetorical question about a possible list of nations that have prospered by going in the opposite direction. 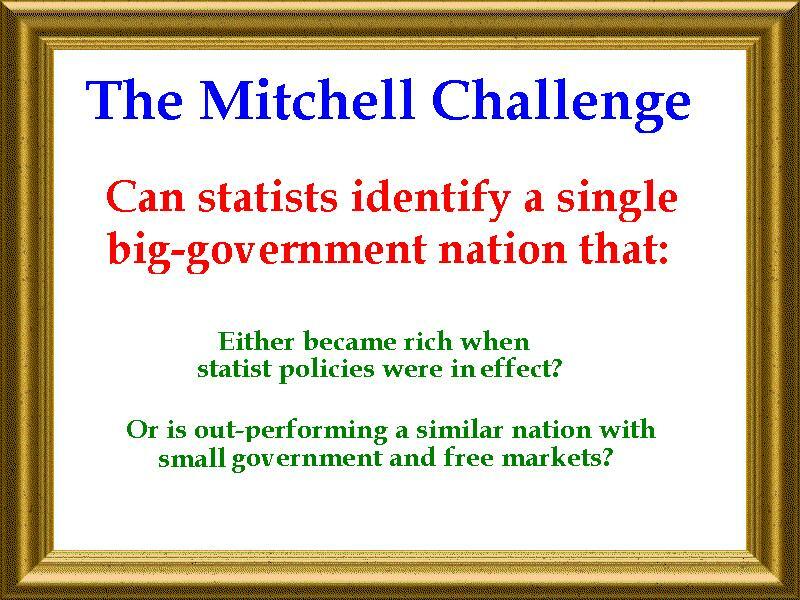 Are there any success stories based on tax hikes or bigger government? 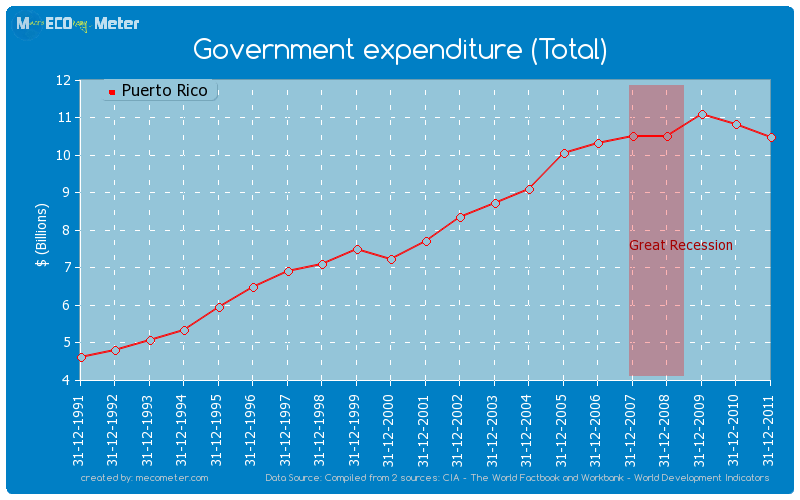 In other words, Puerto Rico is in trouble because it violated the Golden Rule and let government grow faster than the private sector over a sustained period (just like Greece, just like Alberta, just like the United States, etc, etc). The numbers aren’t adjusted for inflation, so the increase looks more dramatic. 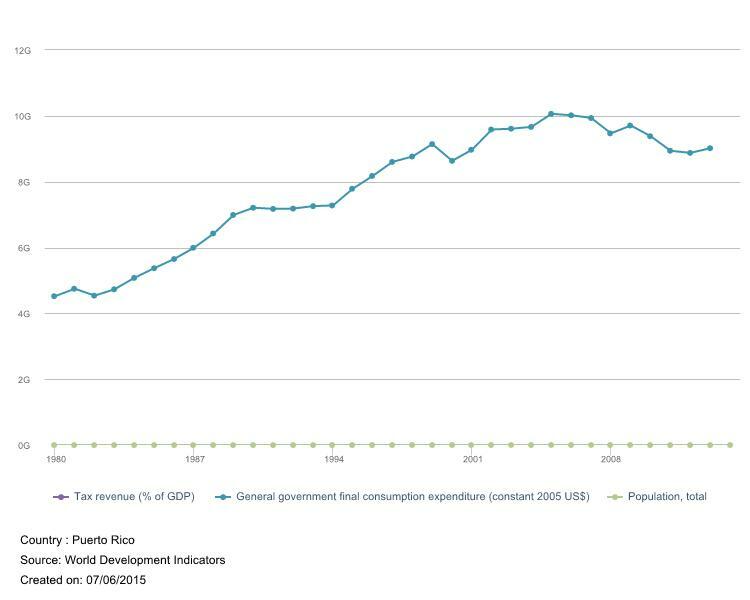 But even if you consider the impact of a rising price level (average annual increase of about 4 percent since the mid-1980s), it’s obvious that government spending has climbed far too fast. Eventually even those riding in the wagon have worse lives than those who pull the wagon in freer nations. Freer from the totalitarianism of the collective. And even as the wagon does keep moving, it does so slower than other wagons. As you find yourself in the middle of the pack malaise sets in. Today’s luxuries become tomorrow’s worldwide staples. If you grow below the world average, you won’t have those. You will be the middle class citizen of a middle income nation. You will live in tomorrow’s Argentina. More intelligent people will open other options and let the pitchforkers boil in their own brew. The fact that exit taxes have already been implemented should be a warning to those who think there is plenty of time left to think about it. The pitchforkers have declared their intentions. Wait at your own risk. I was in Puerto Rico several years ago and pleased to hear that they had moved to a low flat tax. Our taxi driver was happy to announce that several companies had recently moved to Puerto Rico to take advantage of the tax rates. Just goes to show that regardless of the tax system, if your spending is too high as a percent of GDP, things are going to hit a wall.